Somebody asked recently what the significance of Bedd yr Afanc might be, given that it lies less than 2 km from Craig Rhosyfelin. As a geomorphologist who thinks Craig Rhosyfelin has no archaeological significance whatsoever, I think these locations are purely coincidental. 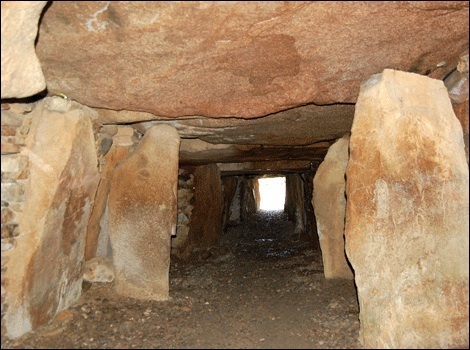 All we know about Bedd yr Afanc is that it is a ruinous gallery grave or passage grave with certain similarities with Irish or Scottish gallery graves, located on a low mound in a very boggy and open landscape. What we have is a single long gallery, without any side chambers. It's the only grave of this type in Wales. It's in a very beautiful location -- one of my favourites. What we see today is a row of paired stones, nearly all of them less than a metre high -- with some traces of fallen capstones. The gallery is just over 10m long. One would expect there to be more capstones present (maybe at least ten of them) -- and some have suggested on this basis that the building project was never completed. Clearly the ambitions or resources of the builders of Bedd yr Afanc were more modest than those who inhabited Jersey and Brittany. But does the presence of Bedd yr Afanc suggest that there was a thriving Neolithic megalithic culture in this area at about the time when Stonehenge was built? A culture, yes, but was it a THRIVING one? The only other features in the area are the Waun Mawn standing stones -- which again seem to me (see previous posts) to have represented ambition but not a lot in the way of capacity or competence to complete a circle-building project. 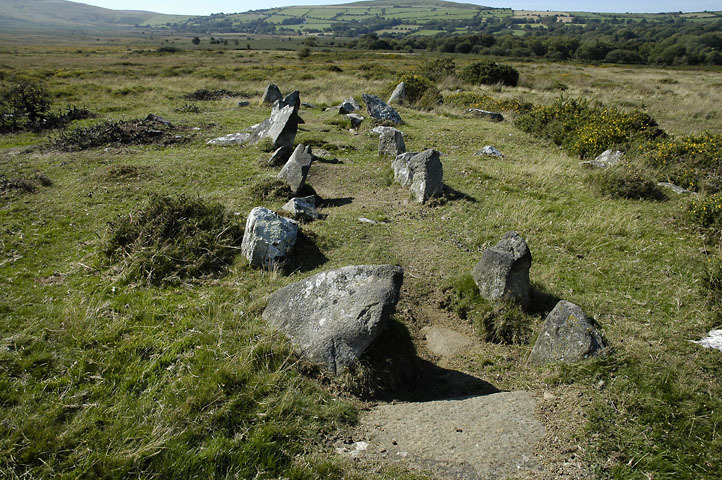 It seems to me that some of the tribes or family groups on the north side of Preseli were maybe tapping into megalithic building traditions carried into the area from outside, but were not numerically strong enough to carry them through. Other groups were clearly quite competent enough to build Pentre Ifan burial chamber and the other cromlechs in the "Newport Group" -- but of course we know nothing about whether there was cooperation or rivalry between the groups involved in all these projects, and the various structures may also differ quite widely in age. Very interesting post Brian. Thanks. I think you point out that there may be several cultural influences even within the relatively small area of Prescelli. Some remains like Pentre Ifan impress because they are BIG, others are seemingly built to fit into the landscape unobtrusively. This cultural diversity should not be surprising given the proximity to the sea and ancient trade routes like "The Golden Road" and the sheer amount of time that has passed. 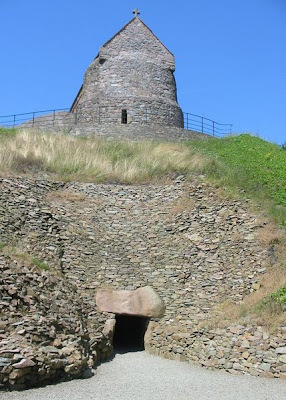 I am puzzled myself, given the relatively close proximity of the Boyne Valley, why nobody on the Welsh side of the sea appears to have been inspired to build monuments on such a big scale - assuming there was this Irish-Welsh-Scottish connection that you presume. Maybe they were not capable economically; maybe they had a different idea, maybe we have not yet discovered the entrance to this "other world". The area around Bedd yr Afanc and Rhos-y-felin shows a long period of building with stone extending from the Neolithic throughout Bronze and Iron ages to the Mediaeval, and even through to the modern day - there are hundreds of foundation remains. Dependent on the attitude of the farmers, convenient stones might have been reused several times. It is a minor miracle that anything remains in an original location. It seems to me clear that the builders and subsequent users of Stonehenge attributed a high value to the Welsh stones, however they were transported. Maybe when we understand more about Prescelli we will come closer to understanding why this was, so thanks again for this post. The bluestone argonauts -- why would they bother? Lots of Earth Science -- why? Glacial deposits from the Early Devensian? An Early Devensian Glaciation in Wales? The meteorite -- another "blau stone"?